After a bubbly afternoon of Champagne tasting in Paris last week, I promised to make this ‘French Berry’ Gratin recipe with thoughts of that 100% Pinot Noir evoking grilled fruits. 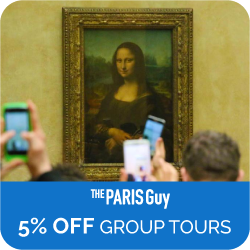 Isn’t it incredible how wine tastings can leave you dreaming about accompanying foods? A fruit gratin is popular in France – probably because it not only showcases the sweetest of seasonal fruits, but it’s also such a quick yet elegant French dessert to whip up in under 30 minutes. This kind of gratin isn’t to be confused with a Crème Brûlée, where the top has a thick layer of sugar and is burned to form a hard cracking layer on top. I have a classic recipe in Mad About Macarons, but try this Milk Chocolate and Passion Fruit Crème Brûlée – it’s from another planet! Instead, this gratin dessert highlights the fruits; it’s lightly grilled without the crunch and it has a more liquid form of custard, rather similar to a Crème Anglaise rather than set. That’s why it’s a handy summer recipe to have if you don’t want the oven on too much during a heatwave. Although I say ‘sweet’, this berry gratin has just enough sugar added but not too much to overpower the natural sugars in the fruits. It’s on the same lines as this Rhubarb and Strawberry Gratin – have you tried it yet? I’d normally make this using a vanilla pod/bean but this time I felt like some elderflower to highlight the strawberries. If you’ve tried my Strawberry Eclairs with Elderflower Cream recipe in Teatime in Paris, you’ll know what I’m talking about! As I’m not lucky enough to have elderflowers around, I cheat with a little cordial (Ikea have one) or syrup (Monin’s is good). However, if you have Elderflower liqueur such as Saint Germain, then that’s great too! If you’re not into elderflower, then infuse this cream with some lemon verbena – so many variations are easy to dream up for this berry gratin recipe. 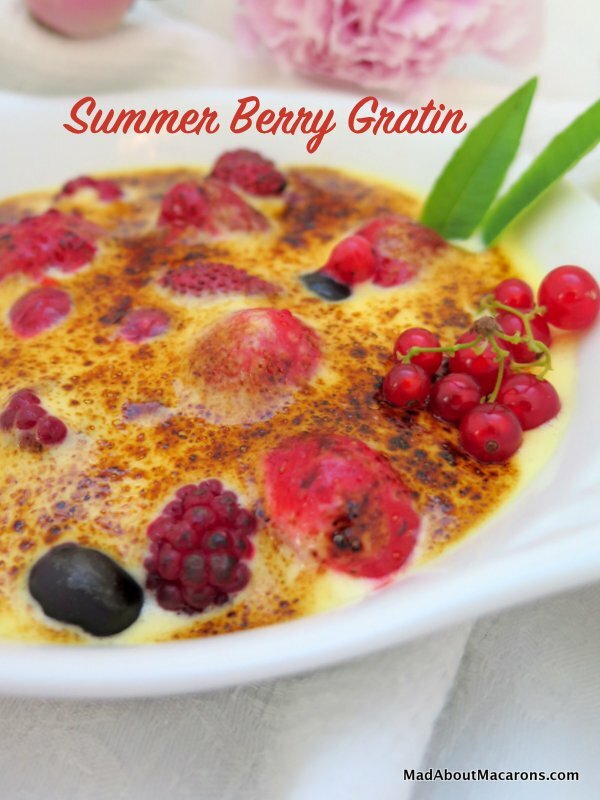 Summer red fruit berry gratin, a quick yet elegant French dessert with fresh berries topped with an elderflower cream and toasted under the grill for a couple of minutes. Divide the mixed berries between 4 ovenproof dishes and spread them out in a single layer. In a bowl, whisk together the yolks, sugar and vanilla until light and creamy (about 5 minutes). Continue to whisk, adding the cordial/syrup and the cream until well mixed. Pour over the fruits and place under a hot grill for just 2 minutes until the cream is toasted but not burned. You could also use a blowtorch instead. Serve immediately - or prepare a couple of hours in advance, chill then reheat in a warm oven at 140°C for about 5 minutes. There are countless floral variations to this recipe: replace elderflower cordial/syrup with violet or rose syrup. Or replace the syrup with 25g more cream and infuse with lavender or lemon verbena. 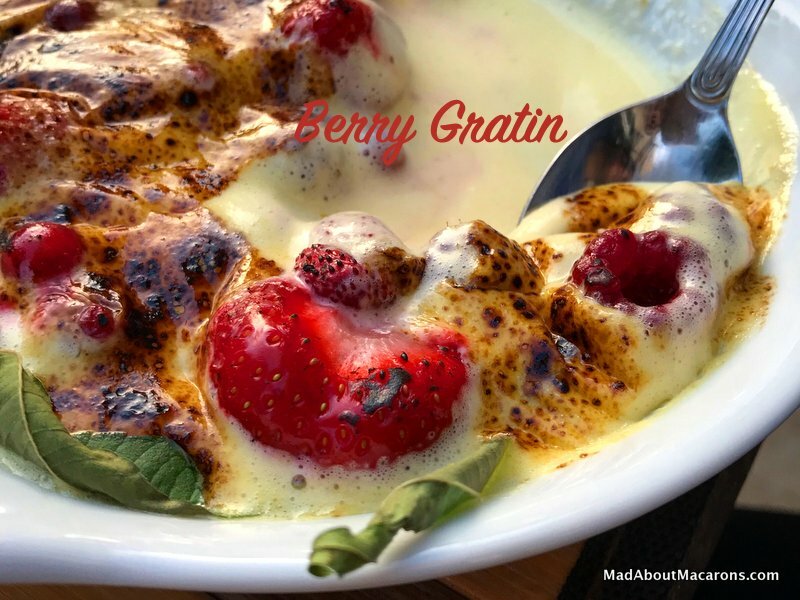 Have you made any of the recipes from le blog or fancy making this Berry Gratin recipe? Please do leave a comment below or take a picture and hashtag it #MadAboutMacarons. I love to see your creations on Instagram and Facebook. Thanks so much for popping in! 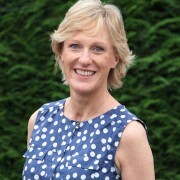 Just to let you know I’ll be rather disconnected on my annual travels (as ever, like the French, we leave Paris at this time!) over the next 3 weeks but will try to pop in when I can. 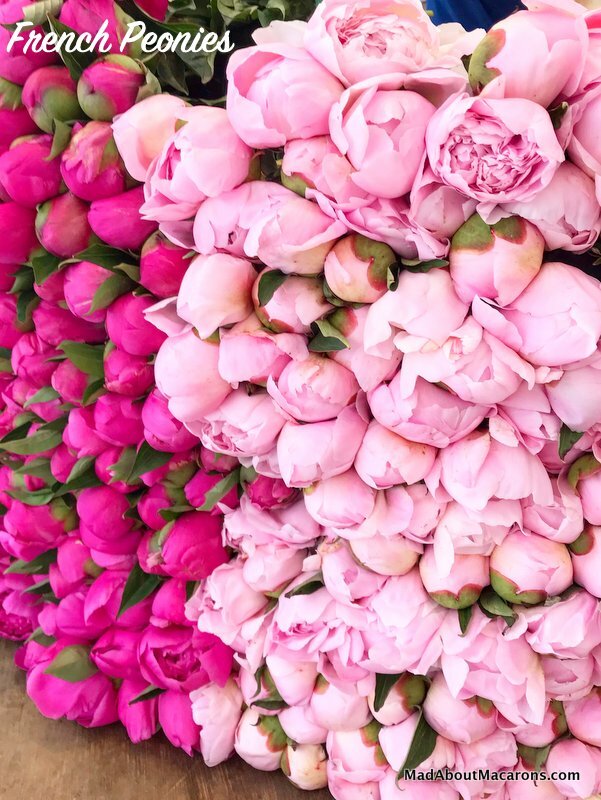 Have a lovely summer, wherever you are! Speaking of French Berries, don’t forget to wear a hat! Who said that a French Clafoutis should be made only with cherries? Cherry season has perhaps started in France, but let’s first celebrate the most sweet, shiny seasonal strawberries with a Strawberry Pistachio Clafoutis. With some desserts, I’m fussy – especially with French Clafoutis, a speciality of the Limousin in France. In my honest opinion, a clafoutis is a light, set eggy custard that’s perfumed with fresh seasonal fruits (traditionally made with cherries – see this classic Cherry Clafoutis Recipe with a hint of almonds) and not a stick-to-the-top-of-your-mouth heavy cake-like dessert that can taste of too much flour. I urge you to try this twist to the classic – not unlike the Raspberry Clafoutis with Lemon Verbena – where I’ve replaced the flour with fragrant pistachios. If you’ve been following the recipes on le blog, you’ll notice that strawberry and pistachio are one of my favourite flavour combinations. Haven’t tried this combination yet? Then do try this strawberry pistachio panna cotta (serve with pistachio macarons and it’s heaven! 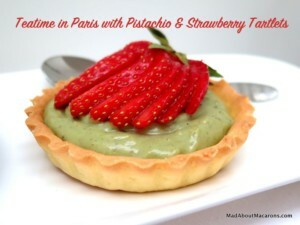 ), or the strawberry and pistachio tartlet recipe from the tart chapter in ‘Teatime in Paris‘. I’m sure you’ll be concocting many more of your own twists with this combination in your recipes. The other day at the market in Saint-Germain-en-Laye, I simply got carried away. Well, tell a Scot there’s a promotion or special price for 4 packs of sweet-smelling strawberries and I pounced on these Fraises de Charlotte like they’d go out of fashion tomorrow. 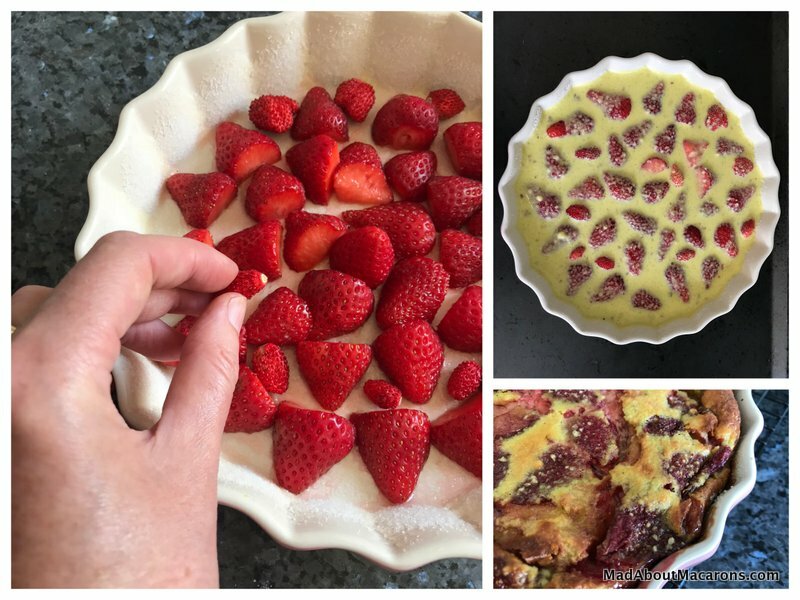 Needless to say, the last couple of batches were just ever so slightly fatigué, so baking them at this ‘just becoming tired’ stage is perfect for making this Strawberry Pistachio Clafoutis. I do stress that you use fresh strawberries and not frozen for this recipe, so that all the flavours are at their best. Adding in some wild strawberries to fill in the gaps! I still can’t believe that we’ve been blessed by the birds spreading a carpet of wild strawberries (fraises des bois) in the garden this year. I thought that mint in the herb garden took over the other plants, but I’m now surprised to see the strawberries popping up in all nooks and crannies, as we say in Scotland. They’re like tiny voilet-tasting bonbons. In this strawberry pistachio clafoutis, it’s the strawberries that dominate: baking strawberries in this way intensifies the flavours – it’s incredible! The pistachio is quite subtle but adds that extra intrigue to the fruit, plus helps to soak up the juices too. Please note, that for all my recipes, I encourage you to weigh out your ingredients using a digital scale (find out why in this post), so that you have continued successful results each time you make this. 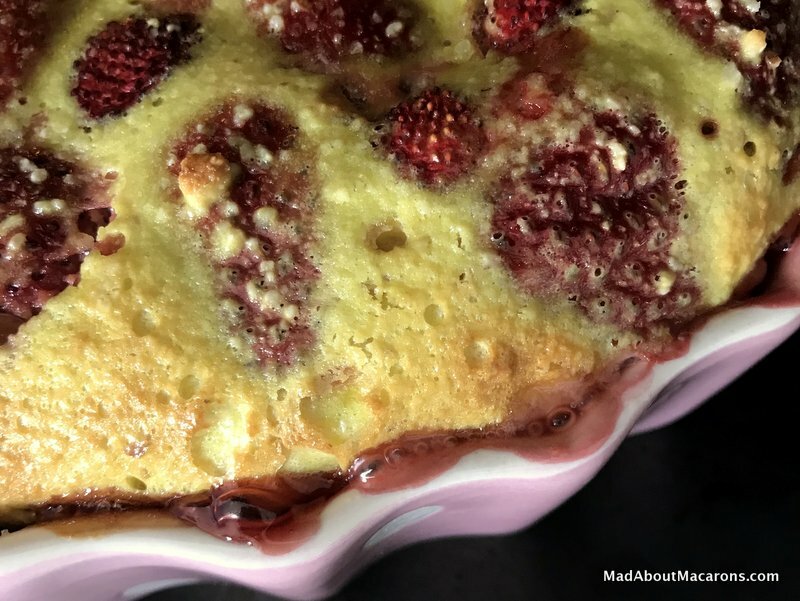 Strawberry Pistachio Clafoutis, a delicious twist to the classic French cherry baked custard dessert using sweet fresh strawberries and pistachios to soak up the juices- and it so happens to be gluten free too. Preheat the oven to 180°C fan/ 200°C / 400°F (gas 6). Butter a gratin or pie dish and top with about a tablespoon of sugar, shaking the dish to spread it evenly. Lay the strawberries over the surface in one layer. In a bowl, whisk together the eggs, yolk, sugar, cream, ground pistachios and extract, if using. Pour this egg mixture over the strawberries and bake in the oven for 30 minutes or until golden brown and cooked in the middle (it shouldn't sink in the middle). I'd suggest placing the dish on baking tray to catch any sticky juices that could run out, if too full. Set aside to cool and either serve at room temperature or chill in the fridge until ready to serve. Matching wines with strawberries: this is great with a light fruity red such as a Pinot Noir (from Alsace or a Burgundy), or a gamay Beaujolais Cru as it brings out the fruitiness yet light enough not to overpower the dessert. Otherwise a chilled rosé Champagne or New World fizz. Have you made any more of the recipes from le blog or fancy making this French Clafoutis dessert? Please do leave a comment below or take a picture and hashtag it #MadAboutMacarons. I love to see your creations on Instagram and Facebook. Sign up for your free email alert, straight to your inbox: choose from daily, weekly or monthly to be informed when new posts are on the website. Your email is never shared and, as always, you can easily opt out at any time at the bottom of every email. Thanks so much for popping in! A perfectly light dessert that celebrates summer in France. I’m on a roll again. 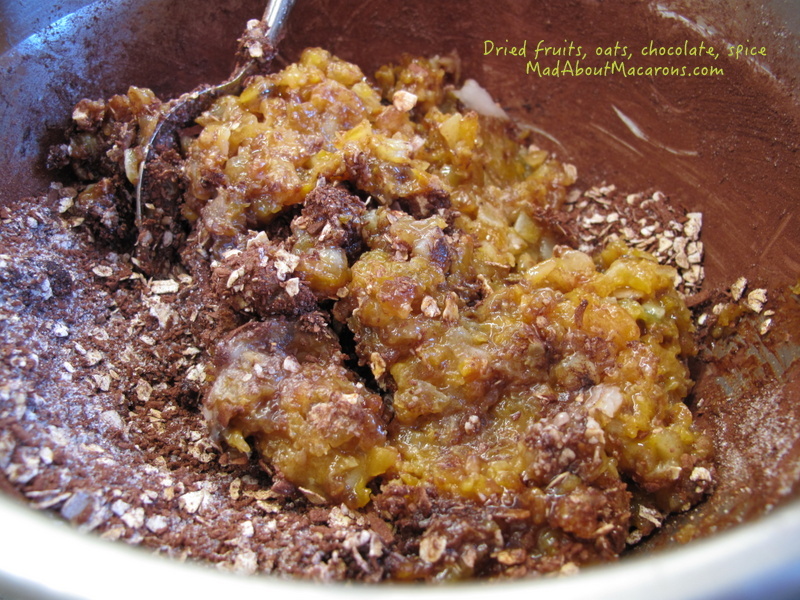 Healthy, easy, no bake, no fuss and festively tasty. 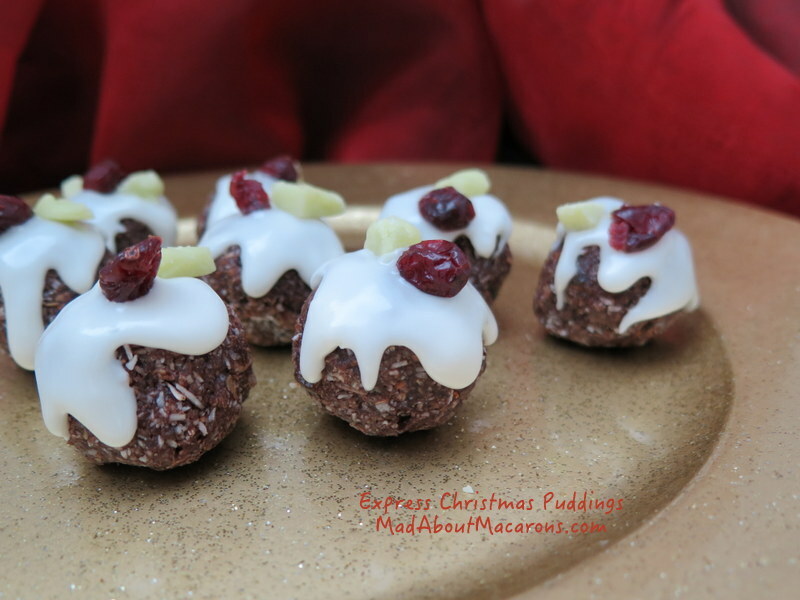 Put these welcome words together at this time of year and you get … express mini Christmas puddings! They taste of Christmas and they’re gluten free, Vegan and Nut-free (although do check dried fruit packet ingredients just to be sure). 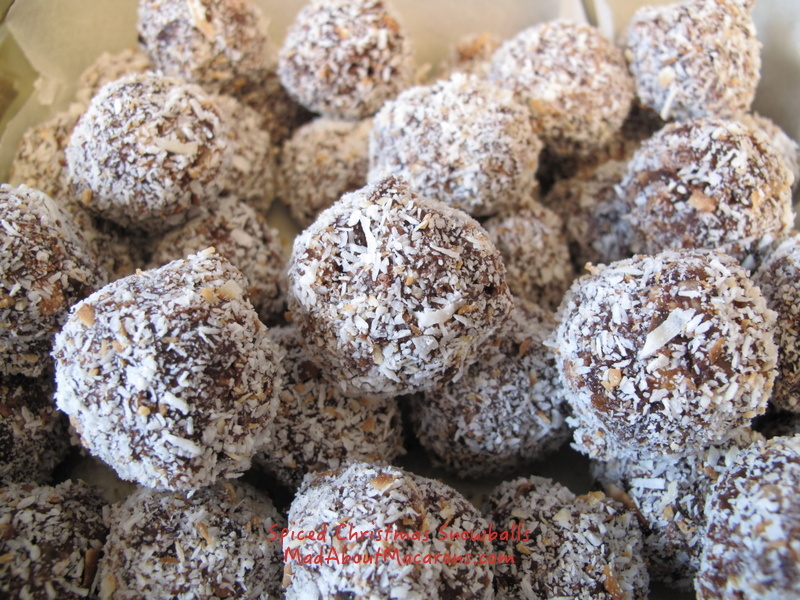 This recipe started out as ‘snowballs’ from my Scottish Granny’s Black Book, using only oats (mainly), raisins, cocoa powder and milk then covered in desiccated coconut. After experimenting with Granny’s recipe, I’ve rather altered them since, alas, I found them way too sweet. I also wanted an extra Christmassy taste with the addition of more dried fruits, gingerbread spice and orange peel, especially. For the snowball look, I just roll them in desiccated coconut, as Granny used to dip them in icing first then in coconut – but by adding a bit of orange juice and making the mixture quite wet, the coconut sticks no problem without the extra sugar. We started out as snowballs – look! 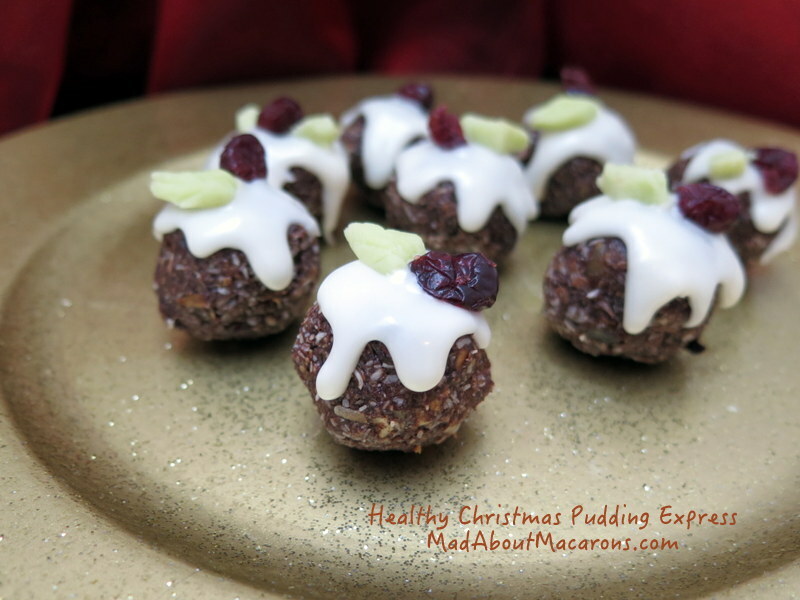 However, a couple of years ago, I saw the most gorgeous picture of mini Christmas puds on Pinterest, via the blog, IncludingCake. 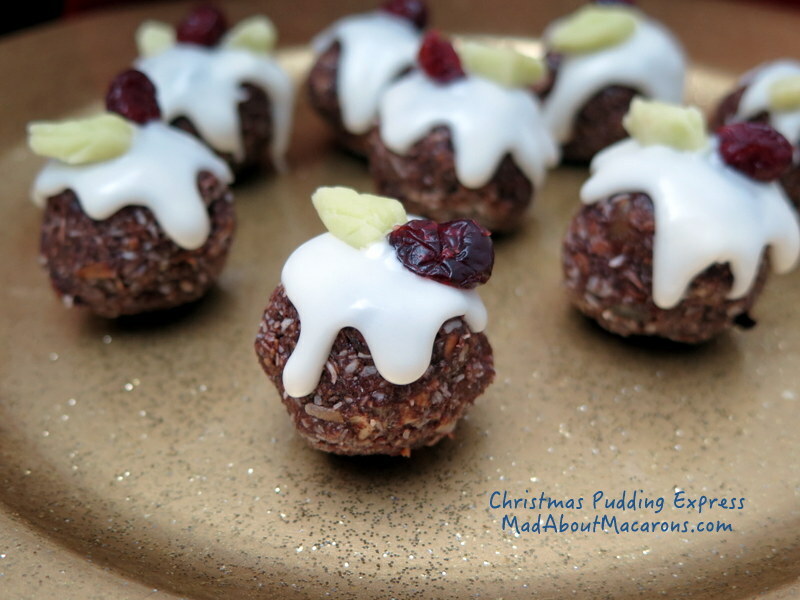 She had rolled actual Christmas pudding cake into cute little puddings and I pinned it to remind myself to make them one Christmas – so thank you, Jo, for the pudding inspiration! However, I turned the filling around from Christmas puddings to a gluten free/vegan version that feels just as Christmassy with the flavours. So how do we give these snowballs a make-over Christmas pudding effect? To cover, melt white chocolate or make up a quick icing of icing/powdered sugar with a little orange juice – or why not a boozy splash of Grand Marnier, just to be naughty (but for adults only.)? 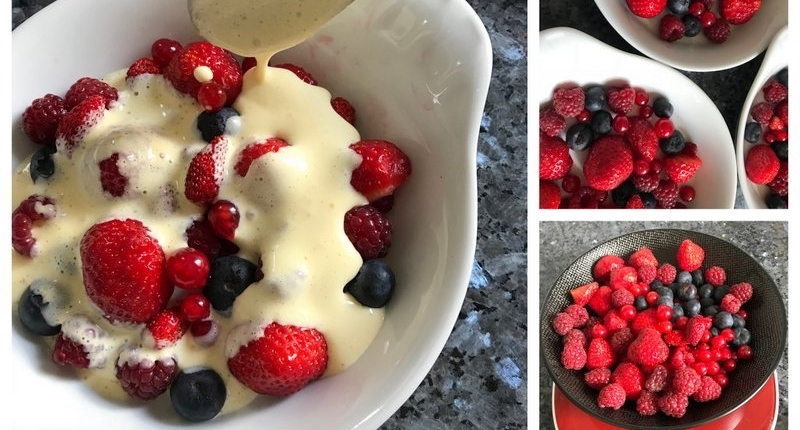 This recipe is inspired by Granny’s recipe in her Black Book and so I’m sure it came from a magazine, the Sunday Post newspaper or the Jimmy Young radio show back in the 70s. If you’re watching over, sorry for altering it so much, Agnes, but I know you would have loved them! The oats, raisins and coconut are still in there, though, plus a much reduced sugar quantity. 1. Place all the above ingredients in a large bowl and mix together with a spoon until all the flavours are well blended. If the coconut oil is solid, melt very gently for just a few seconds in the microwave. 2. Form little balls by rolling a couple of teaspoons of the mixture at a time in the palm of your hands (you could say this is a handy recipe!). Set aside on a plate or baking sheet and place in the fridge for a few minutes. 3. To cover, either melt 50g good quality white chocolate in the microwave (or in a bowl over a pan of simmering water – bain marie) or make up some classic icing by mixing icing/confectioner’s sugar with a teaspoon of orange juice (or Grand Marnier for the adults). Dribble this on the top to form the sauce effect and top with a dried cranberry (craisin) or bit of glacé cherry and green marzipan, cut to shape. Store in an airtight container in the fridge for up to 3 days. Best eaten at room temperature with your favourite cup of tea at teatime or festive sparkly. Wait a minute. Please stop what you’re doing, just for a few moments. Don’t make a sound. Just listen. Do you hear them? Sleigh bells jingling faintly in the distance. I’m off now. Back to some responsibilities, like setting up the crèche to really get in to the Christmas spirit and remind the children what Christmas is really about. Before I go, I’m absolutely thrilled and honoured to be featured with such impressive company in the Huffington Post’s 2014 Best Cookbook Gifts for Cooks and Food Lovers on Your List. Thank you for adding Mad About Macarons to the list, Jamie Schler. What a lovely sweet ending to the year! Good luck and have fun with all of your Christmas and holiday planning!